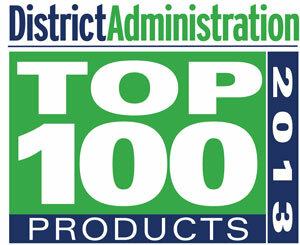 [Grandville, MI] (PRLOG)-WriteSteps, an evidence-based, award-winning, 100 percent Common Core K-5 digital writing program, has been chosen as a product for District Administration’s Readers’ Choice Top 100 Products Award in 2013. Winners were chosen from over 1,800 nominations that were sent in by K-12 leaders detailing the products’ positive impact on their schools. The award’s purpose is to inform superintendents and other school district leaders about products their colleagues around the country are using to help their districts excel. WriteSteps is an innovative, print and web-based learning portal for teachers that provides daily writing lesson plans and student visual aids, videos of modeled lessons, print and video updates, and parent resources. Teachers can access the award-winning writing lessons anywhere there is internet access. WriteSteps works well with interactive white boards, document cameras, and iPads. WriteSteps is also the recipient of Learning Magazine’s 2013 Teachers’ Choice Award, recipient of the eLit Gold Award for Digital Publishing Excellence, and recipient of the APEX Award for Publishing Excellence in Writing.